To book a private lesson with Trevor at Esh Circus Arts, find an available time on the calendar to the right and fill out the form to the left or email this information to Trevor directly at circus@trevorkafka.com. I would like to know if there someone else is interested in splitting this lesson (this lowers the lesson price). I have an aerial-relevant injury (explain below, if Trevor is not familiar). I am a new student to Trevor (please explain your aerial background below, if you have any). I would like this lesson to reoccur weekly. 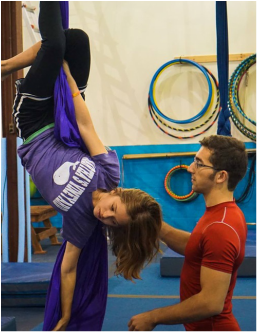 State what type of lesson you would like to reserve (trapeze, silks, handbalancing, etc). OPTIONAL: use this space to elaborate on any of the checkboxes above, state any additional lesson attendees, state your learning goals for the lesson, and/or state any additional information you'd like to provide. Trevor will confirm your lesson as soon as possible (typically within 24 hours of request). ​HOW DO I PAY FOR CLASS? There are five ways to pay for your private lesson, listed below in order of preference. LESSON LENGTH. 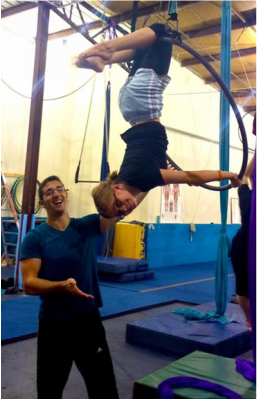 Private lessons with Trevor at Esh Circus Arts are one hour minimum in length. Shorter lessons may be granted upon request by special permission from Trevor (this typically means that the lesson must occur directly before or after an already scheduled lesson at Esh Circus Arts). Lessons unfortunately may not be scheduled by three or more people to meet at the same time and day each week for three or more consecutive weeks. This is part of a non-compete agreement with the host facility. CANCELLATION POLICY. Please notify Trevor via email at circus@trevorkafka.com, text message, or Facebook messenger at least 48 hours in advance of the start time of your lesson if you know you are going to miss a scheduled private lesson. If notification is given late, or if no notification is given, the full fee for the lesson will be charged. ​Other exceptions may be granted for extenuating circumstances on a case-by-case basis at the SOLE DISCRETION OF TREVOR. Youth instruction on aerial silks at Esh Circus Arts in Somerville, MA. Youth instruction on aerial hoop at Esh Circus Arts in Somerville, MA.